The 2014 U.S. Religious Landscape Study is based on telephone interviews with more than 35,000 Americans from all 50 states. 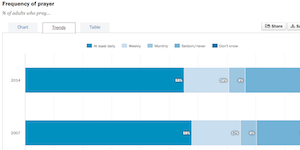 This is the second time the Pew Research Center has conducted a Religious Landscape Study. The first was conducted in 2007, also with a telephone survey of more than 35,000 Americans. The results from the new Landscape Study will be published in a series of reports. Both the 2007 and 2014 studies have margins of error of less than one percentage point for the full sample, making it possible to identify even relatively small changes in religious groups’ share of the U.S. population. But it is important to keep in mind that larger margins of error apply when looking at the characteristics of smaller groups. 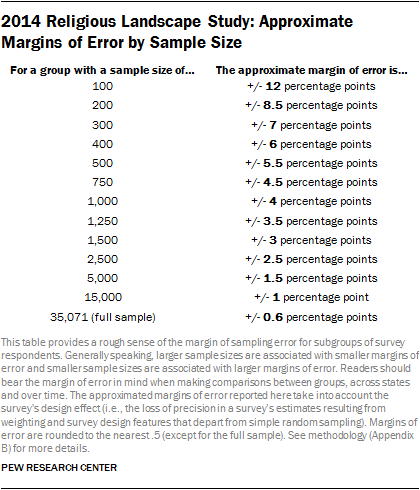 The accompanying table shows approximate margins of error for groups of different sizes. 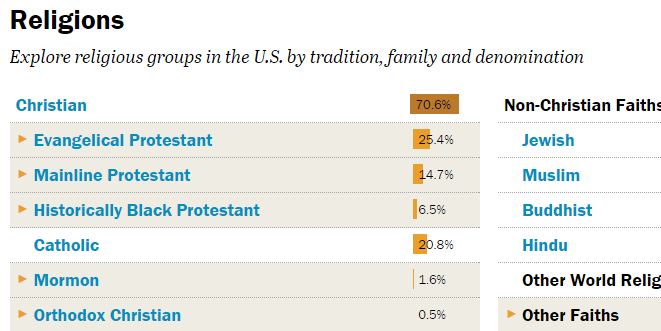 In this interactive tool, national religious composition percentages are rounded to the nearest tenth (e.g., 22.8%). 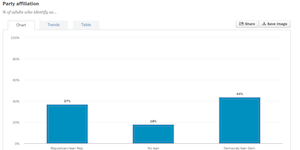 For these figures, anything under 0.25% displays as <0.3%. 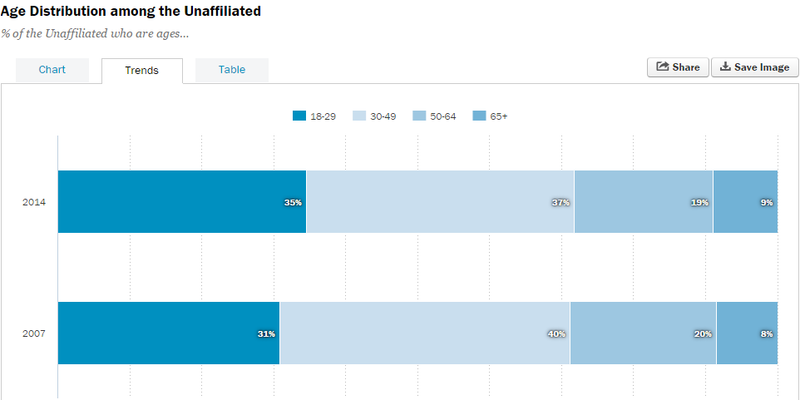 All other percentages (such as state-level data or data on specific demographic groups) are rounded to the nearest integer (e.g., 23%). In these cases, anything less than 0.5% displays as <1%. For full question wording, see the topline questionnaire. 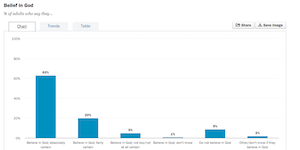 The Religious Landscape Study was made possible by The Pew Charitable Trusts, which received generous support for the project from Lilly Endowment Inc.
We welcome your feedback and suggestions. Please e-mail us.